Before we delve into the mechanics or how to use the fighting system, there are some important questions that should be dealt with. Most sites and even our own Library Articles usually save the FAQ until the end, but it is actually quite vital that we answer them now. Why do we have a fighting system, can’t we just have someone else judge the fight? In order to ensure objective outcomes to fights, a probability-based system was created that relies both on dice rolls and in character development. Using a judge could leave open the possibility for subjective rulings if, say, a judge likes another player better. Do I have to use the fighting system? Sometimes. If you and the other roleplayer can come to a decision about the winner Out of Character, feel free to forego the fighting system. But in situations like rank challenges, where both players want their characters to win, you are obligated to use the fighting system. To win, you need to get your opponent’s health to 0 –like you would in a video game. There are some cases where this is different: see How to End a Fight. Where do my character’s stats come from? They come from your character’s Life Points (hereafter LP). As your character completes threads in Relic Lore, they will grow stronger. Certain points affect the system more, but we won’t get into this until much later. In fact, unless you are super curious as to how the system works, it is not super important to know all of the numbers and how they are implemented exactly –just like in a video game you don’t actually know all of the math that contributes to your levelling up. Where can I see my character’s stats? 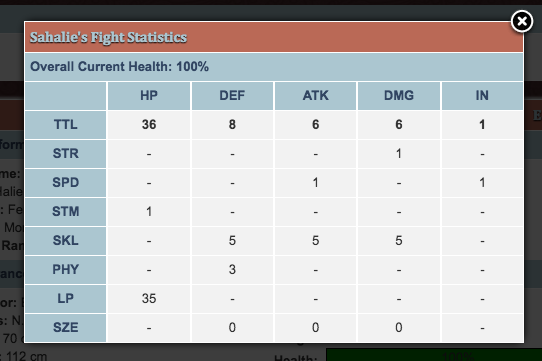 If you go to your character’s profile, in the Vital Information section, on the bottom of the right column there is a number labeled Fight Stats in bold. If you click on this, you will see a pop out with a lot of numbers. Only the very first row of Overall Current Health and row labeled TTL (for total) ultimately matter, because these are your respective Health (HP), Defense (DEF), Attack (ATK), Damage (DAM), and Initiative (IN) Stats. The other rows beneath them show you, in a sense, where the numbers are coming from and how they add up to reach the total. If you would like to know what all the abbreviations stand for, please see the Calculating Stats section. But please know that understanding how all the numbers go together and the math is not necessary to participate in the fighting system. How do I make my characters stronger? In order for your characters to be stronger, they need more LP. In short: you need to finish threads. Just finishing a basic “meet a new wolf” thread will contribute to your character’s health point (HP). Some threads contribute even more however. Think about it: fighting off another wolf or hunting down a bear involves a lot more skill, and should contribute more directly to your character’s strength. Completing threads that give you skill LP, therefore, will be the quickest way to make your character strong. I don’t like x thing I read. Who can I talk to? We are always willing to hear out criticisms or suggestions about the fighting system. Its creation was in every sense of the word a team effort, and we have taken in suggestions from the community on a number of aspects. The fighting system has undergone many changes since its inception at the end of 2012 and it will definitely continue to be improved upon. Feel free to post your thoughts in the Suggestion Box! Though, keep in mind that all changes to the system must be made by Shadow, our one coder on the site. These things are complicated and time consuming, and simple suggestions over complex ones are the best. Yes, if we wanted to we could recreate the combat mechanics from a video game, but at the end of the day this is just a hobby for both us and Shadow and it’s just a way of resolving fights without people’s toes being stepped on. So with that in mind, suggest away! And with that, I think it’s time we started diving in! Well, no one really needs to tell your character how to fight. They can do that part on their own. However, there are some rules that must be closely adhered to in order to ensure that everyone gets out of this alive more or less happy. Never spring a fight on your opponent. Talk things out beforehand. This is the most important rule. We ask that all fight participants respond to the fight request thread acknowledging that they are consenting to participate in the system. Each participant will have 7 days to confirm they want to pursue the fight before the fight defaults to the challenger. Post them in the The Colosseum subforum within Wolf Central, requesting for a dice to be rolled. Always wait for a roll before you post. No dice will be rolled before your opponent posts their consent to using this system (as opposed to the traditional written only system). Base your post off of whether the attack was a hit or miss. If it was a hit, write your post so that the damage done to the wolf is consistent with the damage number from the roll. While you do control how the attack hits or misses, you do not control any aspect of your opponent. Powerplaying is not allowed. If you intend to maim the other player’s character in a specific and lasting way, be a nice person and ask your opponent if they are alright with that. Really, just be a nice person. On all subsequent attacks, you have 3 days to make your post. You must acknowledge the fight request and choose whether or not you consent to the system. You have 3 days to request your own roll and make your post after all fight participants have confirmed they are using the fight system. If your character wants to continue the fight, ask for another roll. If they would like to submit you do not need a roll. Once you have a roll, post with your character’s reaction to the damage, as well as their attack. Make sure your damage is consistent with the number from the roll. And, basically, just rinse and repeat! In the interest of keeping this game a game, please always make sure you are in communication with your fighting partner. This is key in the sense that you may not kill another person’s character without permission. At any time, a player may concede or wish for their character to escape, but the fight is over when the opponent is either unconscious or dead. This is where it gets tricky, so please bear with us. A character becomes “unconscious” at 0 health, but they are not dead until –10 health. Unconscious appears in quotes there because, if a player is willing to forfeit their character’s life in order to continue the fight with a chance of winning, they may continue to fight past 0 health. If a character passes 0 health the fight becomes a “death match.” Again, though, please seek permission from the other player if you are on the cusp of delivering a death blow. Alternatively: How to Escape a fight Escaping is a difficult concept at times, because certainly we don't want our characters killed on accident, but on the other hand it's unfair to other players if your character magically escapes a choke-hold. Also, realistically, if your wolf is one that likes to trespass for fun you should be prepared for some amount of consequences. That being said, your character can escape: they just need to roll for it! The roll will look like a normal attack roll, but instead you always have the opportunity to do damage (if it was a hit) or escape as long as the roll was successful. For unsuccessful rolls your character cannot escape. A small caveat, however, comes in to play when very important fights (i.e. rank challenges) drag out forever and your character’s future is at stake. In these cases, each participant has a maximum of 3 days to ask for their roll and make a post. If 3 days pass in a fight without an opponent posting, please post in the roll thread letting the mods know. If you wish the fight to continue in spite of the time limit passing, the fight can go on. Not posting about the time limit is considered consent for the continuation of the fight. In other words: it is your duty to post about the fight defaulting. The moderators may not always be watching. Alright, great, so you know how to fight. The next important step is learning how to interpret the rolls posted by the moderators. This is more or less intuitive, so we won’t dwell long on this, but it is important to understanding how to make your post (i.e. if it is a hit or miss, how much damage to do in your post, etc.) There are two parts of every roll: the attack roll and the damage roll. Here the moderator will roll a 15 sided die (hereafter d15) and give you the outcome. This number will be added to your character’s Attack Stat (ATK) and then compared against your opponent’s Defense (DEF) Stat. The number from the die plus the number of your Attack stat is equal to or greater, your attack is a hit, otherwise it is a miss. If you roll a 15 the attack is automatically a hit (or a critical hit). you roll a 1 the attack is automatically a miss (or a critical miss). The moderator will tell you if the attack is a hit or a miss. Here the moderator will roll a 6 sided die (hereafter a d6) and give you the outcome. number will be added to your characters Damage (DAM) Stat to give the total number of damage done to the other character. And really and truly, this is all you need to understand in order to participate in moderated fights on the site. All the math and the numbers is, otherwise, unnecessary. However, if you are interested in knowing where exactly the numbers come from and how the math works you may read on. Knowing how the numbers work may help you develop your character into a better fighter or help you with making a new character, but these benefits are not so important that continuing in the guide is at all vital. In order to continue there are a few definitions that are required. Defense (DEF): More or less a character’s ability to dodge attacks. Damage (DAM): How hard a character hits when they land an attack. Initiative (IN): This is only used in multiplayer fights. It determines who is the first to move. Faster characters get the opportunity to attack before slower ones. This shows up on a colored bar on the character’s profile. Characters who are healthy maximize their abilities to fight. Characters with low health cannot fight as well, and their overall stats will be reduced. Conditional Modifiers: meeting or not meeting these conditions will change your stats. Static Modifiers: These are points you assign to your wolf upon joining and they cannot be changed. Growing Modifiers: These are points you will accumulate over time. Overall Health affects the total output of any of the stats in a straight forward way: if a character is at 100% health, they will have 100% of their stat points. But if a character is at 50% health, all of their points are halved. For example, even if at max a character has an Attack Stat of 6, if their overall health is at 50% they will have an Attack Stat of 3 instead. Going by the table on our character’s profiles, we can see what modifiers add together to make a specific stat. In layman’s terms: Wolves that can last a long time (running, swimming, ‘fighting’), and have completed lots of threads will be able to able to last longer in fights. 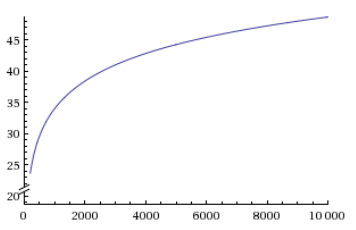 In layman’s terms: Physique is mostly there for the main bulk of points, however, Large wolves will be put at a larger disadvantage since they are a bigger target, and vice versa smaller wolves doing better defensively. However, wolves with more experience can overcome any size or age obstacles. In layman’s terms: Fast wolves are better at landing hits, which will usually be medium sized wolves. Again, experience also helps with accuracy. In layman’s terms: Strong and large wolves cause lots of damage. But sometimes, knowing where to hit can definitely help maximize damage. In layman’s terms: This stat is only controlled by how fast a wolf is. It’s like a reflex, something that by definition cannot be trained or improved. As you can see, Skill factors into most of the stats, which is why earlier we said that threads where you hunt or fight will impact your character’s fighting abilities the most. Because you decide your Physique points (Speed, Stamina, and Strength) and your character’s size when you join, this part of your character’s abilities are locked in. Total Life Points and Skill are the only things that you may continue to effect as your wolf grows. If knowing how the stats are calculated is still not enough, we are fast approaching the “nitty gritty” of the fighting system where there are actual numbers and math. Of the 9 modifiers, 4 (Speed, Stamina, Strength, and Physique) are calculated the same way with the other 3 (Skill, LP, Size) having their own individual calculations. Size is very straight forward, so we will start with it. Conditional modifiers bear this name because these are aspects outside of the Life Point system that still affect the Fighting Stats and involve characters meeting or not meeting certain conditions. Currently, Size (SZE) is the only conditional modifier. Static modifiers are the ones that don’t change after joining (Speed, Stamina, Strength, Physique).The basic rule here is for every 25 points a character has in a particular modifier, they get +1 towards the stat connected to that modifier. However, it is important to understand that since this is a discrete system (if it went from 1-25 and then from 25-50 there would be overlaps and it would make no sense), it’s not as simple as saying that 25 points = +1. Take a look at the table below to see how it works. Of course, just by looking at that formula it's hard to see what it means. 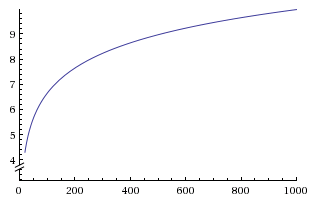 Therefor we've whipped up some sample calculations and added in a graph for your viewing pleasure. For more information, or if you'd like to play with the function to do your own calculations, visit wolfram alpha for LP or wolfram alpha for Skill.